With time almost up on the clock, Japan rolled the dice on England's south coast. A successful kick at goal could have secured a draw against two-time world champions South Africa -- a remarkable result for a team of Japan's stature. Coach Eddie Jones bayed from the sidelines for his team to take the kick, but captain Michael Leitch thought otherwise. 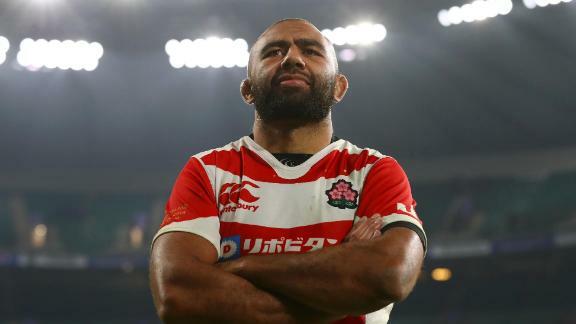 Leitch wanted a try -- five points that would thrust Japan into the history books with the greatest upset in Rugby World Cup history. "I'd rather go down challenging South Africa than kicking the goal, missing, and regretting it for the rest of my life," Leitch tells CNN. They say fortune favors the brave, and the aptly-named Brave Blossoms -- who showed courage and nerve by the bucket-load on that day in 2015 -- were richly rewarded. When Karne Hesketh slid over after multiple energy-sapping phases of play to give his side a famous 34-32 victory, pandemonium ensued inside Brighton's Amex Stadium as Japan celebrated only its second victory at a Rugby World Cup. This was the nation's finest hour on a rugby pitch, a thrilling spectacle and a giant-slaying for the ages. Captain Leitch can hardly forget the moments leading to that final try. "It was probably one of my better decisions," he smiles. The sight of Daisuke Komura, draped in a red-spotted poncho and shedding tears of joy at the final whistle of that game, was beamed on TV screens around the world. A lifelong Japanese rugby fan, he could scarcely have dreamed his travels to the UK for the World Cup would arrive at this point. "I was as happy as when my first son was born," Komura tells CNN. "I can't describe how I felt. It was an experience that I would never ever get again. I was truly moved." Like the thousands in the stadium, Komura urged his side to play for the try in the closing minutes. Sitting near him was now England boss Jones, who looked on as the players continued to defy his instructions. Come the final play, Jones couldn't watch. "Eddie was sitting right behind me and left in anger as he wanted to see a shot at goal," says Komura. "I guess he didn't see the deciding moment, but when I turned back I saw Eddie coming out again with a big smile. We shook hands. His face was full of surprise and shock -- it was a funny moment." Jones has been credited with masterminding the fast-paced game plan that saw a physically inferior Japanese side run South Africa ragged. As the match wore on it worked a charm, the Brave Blossoms enjoying the lion share of possession and territory in the second period. The victory, as Leitch explains, was no fluke: "We named our training 'Beat the Boks' and that's how we trained. "It felt like a training run. That's no disrespect to South Africa, but we analyzed the game to the point where we knew each individual's characteristics. That gave us the advantage." For South Africa, who rallied to reach the semifinals in 2015, that final Hekseth try was a sucker punch to the torso. This defeat wouldn't wash over after a few days; it was a humiliating result for a nation that holds its rugby team on a pedestal. Siya Kolisi, the current Springbok captain who came on as a substitute in Brighton, remembers it all too vividly. "I didn't get to play a lot," Kolisi, who was two years into his international career at the time, recently told CNN World Rugby. "I came on as a sub and then they took me off again because I got a yellow card. I was sitting on the side when the last try happened and it was depressing to see. "You could see it coming from a mile away, as soon as they were passing the ball around. It's the worst game I've actually played in. "We're a different team now, but obviously I don't want something like that to happen again." Japan ended the 2015 World Cup with victories over USA and Samoa, but a defeat to Scotland meant the Brave Blossoms failed to reach the knockout stages for what would have been the first time. There's no doubt, though, that the South Africa game changed Japanese rugby forever. "In the past, when the team came up against a massive opponent like that the guys would have said, 'We're going to lose anyway so why give 100 percent?' says Leitch. "My fondest memory of that game was the guys going at 100 percent the whole 80 minutes." There are eight months until Japan hosts the Rugby World Cup -- the first ever Asian nation to do so. The host nation's pool games have already sold out, where Scotland and world No. 2 Ireland will be the Brave Blossoms' biggest obstacles against reaching the knockout stages. "I think Japan's chances of getting out of the pool stages this time round are very high, but it won't be easy ... The team is very focused and our main goal is not to get out the pool stages, it's to keep on winning." Who knows? Maybe the Miracle of Brighton will be recast as the Shock of Shizuoka when Ireland comes to town.